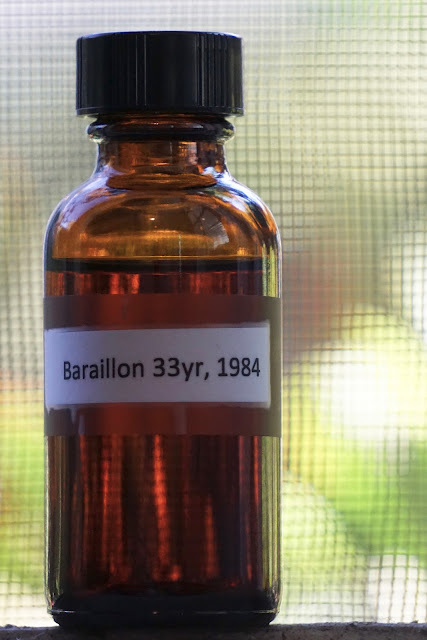 Domaine de Baraillon 1984 33yo (46.0%): Back from our two-week trip... Till I sort out my notes a random sample from my sample yard sounded like a better idea. I picked a 33 year old Armagnac from Domaine de Baraillon. Domaine de Baraillon is a very small and highly praised producer which use their own still to distill their brandy unlike most of the other producers in the region. This brandy is distilled in 1984. Color: Mahogany, chestnut honey. Thick, oily and slow legs. Nose: Poached peaches and apricots. Damp black soil, prunes and wild mushrooms. Toasted oak, grape leaves in brine and aged grappa. Sweet blood orange slices and bergamot jam. Palate: Briny and tart... Grappa again. Gardening soil, very old sherry and aged wine vinegar. Garam masala, unripe grapes and pomegranate molasses. Finish: Long with sour molasses, old oak and vinegar. Orange peel. Overall: Very unique and intriguing expression... It tastes old but on top of it it also tastes like a spirit from an older era. That tart and briny palate reminded me European spirits from mid 20th century I had the chance to taste before. It has qualities almost like an oxidized spirit but it is very enjoyable and quite nice. Like an old Marc. Thanks to Derek Kendzor for the sample.